As we reach the midway point of DC’s mouth-watering He-Man/Thundercats crossover, a lot of my early criticisms of the series are, unfortunately, still holding true. Don’t get me wrong, I’m a massive fan of both franchises (as anyone who knows me will readily attest to), but there’s just something about the slight story and inconsistent tone that’s making this series feel like a bit of a missed opportunity to this point. Plus, as I mentioned before, the dialogue simply isn’t up to scratch in places, with the series as a whole clearly missing the ol’ Dan Abnett polish that helped make The Eternity War such an utterly unmissable read. It’s still a hell of a lot of fun, packed with wonderful little moments and chunky, in-your-face action sequences aplenty, but it also seems to verge almost into self-parody at times, particularly during the scenes featuring Skeletor and Mumm-Ra. The story itself is also fairly non-existent to this point, and seems to be little more than a convenient framework to pit these Saturday Morning Cartoon icons against each other in various configurations. Yes, it’s cool to see He-Man battling Slythe and his mutants, or to see Skeletor going one-on-one with Lion-O, but there still needs to be more to a story than just these moments, and so far, there sadly doesn’t seem to be. 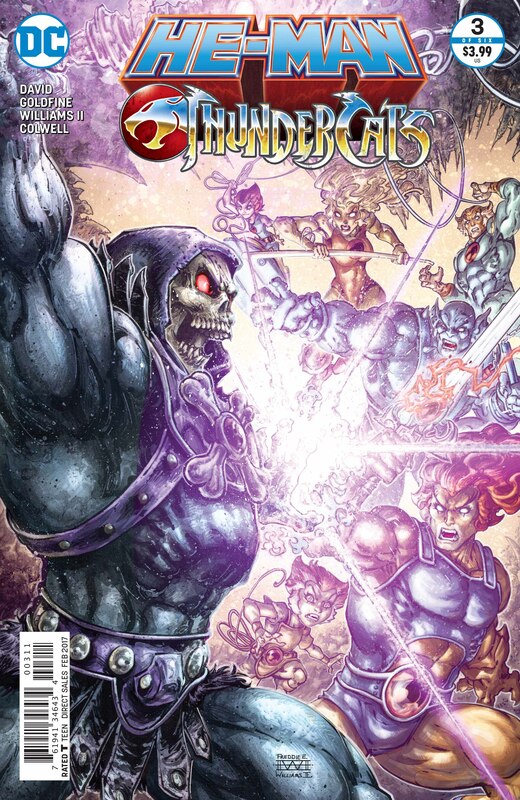 Once again though, Freddie Williams II’s artwork is pretty much worth the cover price on its own, and seeing the Sword of Power-wielding Skeletor taking on the Thundercats is glorious, air-punching fan service of the highest order. As with the previous issues, Williams embraces the larger than life nature of the characters with gusto, creating some suitably over the top sequences packed with rippling muscles and exaggerated facial expressions. The level of detail is impressive throughout, and while I’m still not entirely sold on the colours of Jeremy Colwell, the artwork of this series is undoubtedly its strongest selling point. Ultimately then, while I’m thrilled that this comic actually exists in the first place, I still can’t shake the feeling that the fans of both franchises deserve more. Sure, it’s great to have such gorgeously illustrated pages featuring the inhabitants of Third Earth and Eternia going blow-for-blow, but with a little more storytelling creativity and dialogue polish this series could be something truly special rather than merely the entertaining diversion that it is.